Marine Bay Candolim is a 5 bedroom villa located in the heart of Candolim on the Calangute-Fort Aguada road. The villa is strategically located and is just a short 10 minutes walk from the Candolim beach. You can also find several restaurants, spas, shops, supermarkets and night clubs within walking distance from the villa. The famous and popular Baga beach is also just a 10 minute ride away. Our villa is ideal for the astute travellers and guests seeking value for money. We can easily accommodate groups of upto 15 people be it families, friends or colleagues. The 2 storey villa has a living and dining room with the kitchen on the ground floor. There is one bedroom on the ground floor for the convenience of elderly people in the group. The other 4 bedrooms are on the first floor of the villa. Our bedrooms are cosy and comfortable, furnished with vibrant, bright colours to give you a homely feeling. 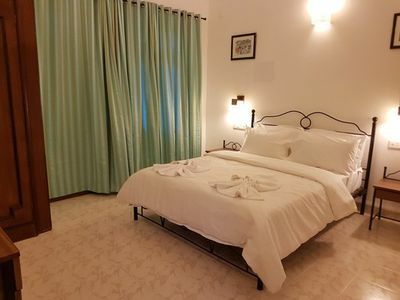 All the rooms are air conditioned with a queen size bed, an attached toilet and bathroom and a small balcony. You can spend your evenings in our living room with a large screen LED TV or get together with friends and family in the garden in front of our villa. We have a well equipped kitchen with a fridge, microwave, gas burner and RO water purifier and all the necessary crockery and cutlery. Our living room is furnished with eclectic furniture for you to gather together and catch a game or a movie on our large screen TV with a DTH connection.